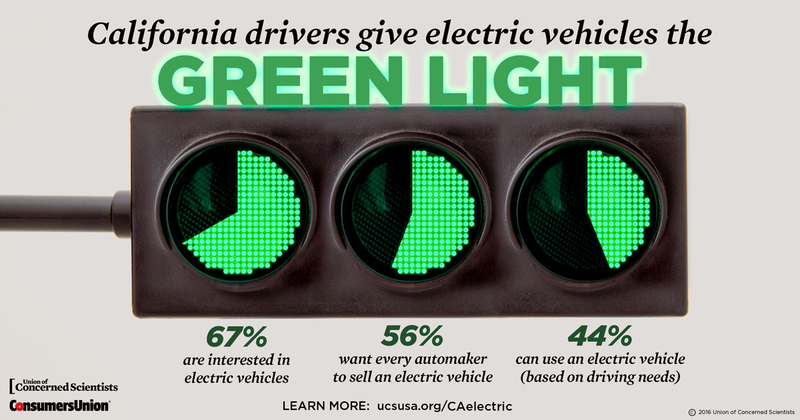 It's not just California; Northeast drivers want electric cars too. For years, we’ve heard the same old story: the success of electric vehicles in California can’t be replicated in the Northeast. But is that true? In early 2016, the Union of Concerned Scientists teamed up with Consumers Union to investigate the driving habits and vehicle needs of drivers throughout the Northeast, and assess how well Northeast consumers understand the benefits of driving on electricity. Our findings were clear: Northeast drivers are ready for electric cars, actively excited by them, and would seriously consider them in purchasing decisions, if the vehicles were available. Yet despite widespread interest and enthusiasm, new car shoppers in the Northeast have fewer electric options compared to California. For example, some electric vehicle models—like the Fiat 500e or Chevrolet Spark EV—are unavailable in some or all of the Northeast states, while all are available in California. We surveyed drivers in California too! See the infographic. Live in the Northeast? Interested in electric cars? Check out some of these helpful resources. The survey was conducted among 1,213 randomly selected adults in California and 9 Northeast states who were licensed to drive and had driven a vehicle in the past 12 months. The survey was carried out from April 1 to April 8, 2016. The margin of error is 4 percentage points at a 95 percent confidence level for questions asked of all respondents. Survey respondents from the Northeast represent a region encompassing Maine, Vermont, New Hampshire, Massachusetts, Rhode Island, Connecticut, New Jersey, New York, and Pennsylvania.